Do you have a minute to spare to learn some English? Sian's going to show you the differences between lay and lie! Give us 60 seconds and we'll give you the English! 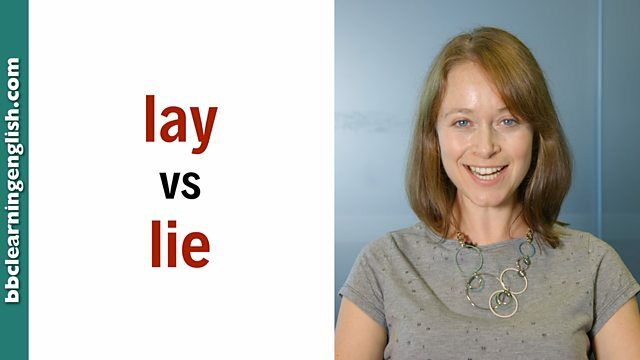 I'm Sian from BBC Learning English, and today we're going to look at the difference between lay and lie. So lay always has an object, and it means 'put something or someone down carefully' – normally in a flat position. When I eat I lay a cloth on the table. You can lay a baby in a cot. The past tense is laid, but careful with the spelling. I laid all my cards on the table. The verb lie doesn't have an object and it means that you are 'in a flat position' or you 'put yourself in a flat position' - so you move on your own. Tonight I want to lie on the sofa and watch a film. But be careful. Now, the past of lie is lay. Yesterday I lay on the beach and read my book. Lay means 'put something down carefully'. Its verb forms are lay, laid, laid. It always has an object. When I eat I lay a cloth on the table. I laid the baby in her cot. She hasn't laid the duvet on the bed. Lie means 'be in a flat position' or 'put yourself in a flat position. Its verb forms are lie, lay, lain. It doesn't require an object. Tonight I want to lie on the sofa and watch a film. Yesterday Sian lay on the beach and read a book. I've never lain on a futon before. Which verb needs an object? Lay or lie? What's the past tense of 'lay'? Which verb is 'laid' the past simple of? Lay always needs an object. Does 'lie'? True or false: The verb 'lie' requires an object.